but was greatly influenced by an even older tradition from China. Literally, “karate-do” means “the way of the empty hand,” referring to the fact that its practitioners use no weapons to attack and defend, but only the hands, feet, and body. Yet karate is much more than merely physical. It is founded on a grand philosophical and spiritual tradition based on Bushido and Zen Buddhist principles. Through hard training and practice, karate develops not only the body, but also the mind and character. You can colour the white wall into various colours by making efforts individually. Push and brace yourself in Karate Do to change your belt step by step from white to black. But to whatever colour your belt changes, its original colour is white. Keep in mind that it implies the warning that you should not forget your original intention. Keep in mind that children do not grow up without parents. Shotokan training is usually divided into three parts: kihon (basics), kata (forms or patterns of moves), and kumite (sparring). Techniques in kihon and kata are characterized by deep, long stances that provide stability, enable powerful movements, and strengthen the legs. Shotokan is regarded as a dynamic martial art as it develops anaerobic, powerful techniques as well as developing speed. JKH training is a 3 step process. First of which is Kihon or basics. 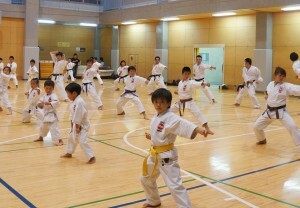 Kihon training is essential to bring the style of Karate to the student. This includes stances, blocks, punches and kicks. The training of muscles with speed, timing and accuracy is imperative. JKH has a proven record to bring the student to a high level of standard, where others fail. Our Students will be taken through a systematic training process. Kata is a very important aspect of Karate training. The student showcases the style of Karate that he/she has learned and puts it into a set routine showing the power, speed and agility the student possesses. We have 26 such forms and each one is more complicated than the other. 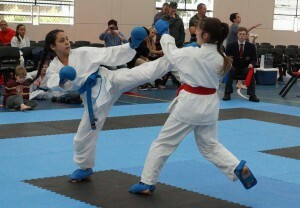 Students will use Kata in competitions. Kumite is the part of karate in which a person trains against an adversary, using the techniques learned from the kihon and kata. JKH has a structured program to slowly and gradually bring the student to a level capable of defending and counter attacking an opponent. Students will undergo a 5 step sparring, 3 step sparring, 1 step sparring and free sparring. Students will have the opportunity to compete with other students from local, state, national and International competitions. A bully usually has low self esteem and the need to feel powerful causes them to seek out others weaker than themselves. A bully senses weakness such as an unwillingness to look them in the eye, hunched posture, rapid breathing when confronted and uncertainty when confronted. Karate/Self-defense is a practical course in assertiveness training. Some psychiatrists have even recommended it as training for patients who lack assertiveness. The format is simple: apply a small amount of pressure, teach the student to handle it, then graduate slowly until the student is comfortable. periodic intervals. A by-product of this is learning poise in front of the Instructor and an audience. Our students develop skills and discipline that reflect positively in all aspects of their lives, all while getting in the best shape of their lives.